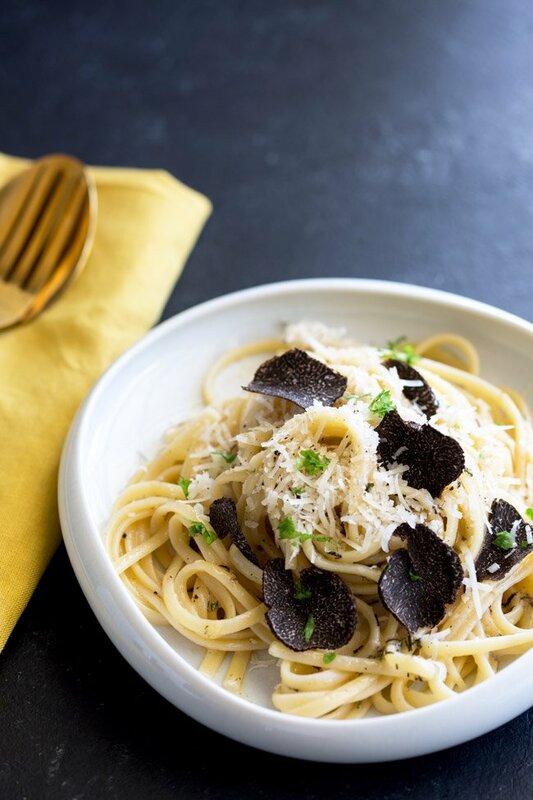 This Black Truffle pasta recipe is a decadent treat for a special date night. 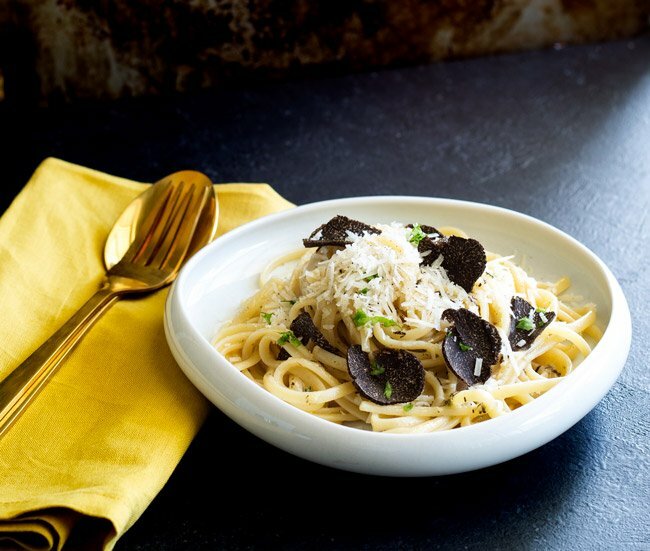 The unmistakably earthy rich flavor of black truffle is paired with everything it loves, butter, cheese and perfectly cooked linguine. This is delicious and special meal and is sure to impress! Plus it is ready in just 10 minutes with just 5 ingredients! 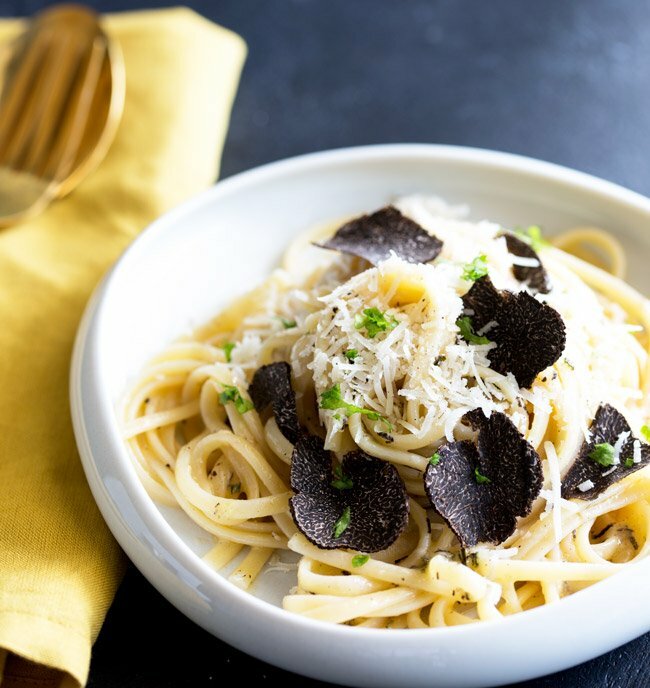 Black truffles work so well with rich ingredients like butter and cheese, the fat in these ingredients absorbs the truffle flavor and carries it though the whole dish, making a small amount of truffle go further. That is why the Black Truffle Baked Brie is one of the most popular appetizers on my blog! If you can’t get fresh black truffles then try the ones packed in olive oil will work well. There are also several companies that sell flash frozen black truffles. The recipe calls for grated truffle in the butter, this ensures flavor is in the sauce. 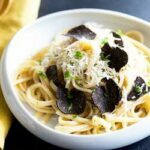 The sliced truffle on top is a wonderful garnish but a sprinkle of grated truffle would add the extra flavor and color impact without using as much truffle. The recipe suggest 1 ounce of black truffle, but the amount you use will really depend on the amount you have. Even a small amount of truffle will make this dish amazing. But if you are a big truffle lover then add as much as you like to the butter. Whilst the pasta is cooking make the very quick sauce of butter and black truffle. Reserve a cup of the pasta water, then drain the pasta and add it to the butter sauce along with some of the pasta cooking water. It is really important to reserve a cup of the pasta cooking water. As there is no cream in this sauce the cooking water emulsifies with the butter to create a luscious and creamy sauce that coats every strand of pasta with the truffle flavor. The parmesan is then added along with some shaved truffle slices and dinner is served. We suggest salted butter as this adds extra seasoning. If you only have unsalted butter, or low salted butter then ensure you season your sauce extremely well with salt to really bring out the earthy flavor of the truffle. Although a little black pepper can enhance the muskiness of the black truffle, be sparing with it. Too much will over power you truffle. Appetizer: Rather than serving a side dish with this we recommend adding a nibble platter to the start of the meal. Plate up some marinated artichokes, olives, burrata/buffalo mozzarella and sun-dried tomatoes. Wine: For this decadent meal, why not pick a vintage champagne. The aged flavor will enhance the musky truffle. Alternatively a white burgundy has the same affect. If picking something different avoid wines with too much acidity or oaked varieties as they will over power your truffle. If you prefer red then pick an older Barolo or Burgundy; their spice and dried fruits notes will help the musky truffle flavor to linger in your mouth. 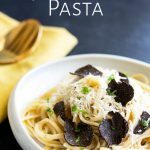 Why not pin this recipe for 5 Ingredients Black Truffle Pasta. Pin it here. If you love Black truffles then why not check out my Black truffle stuffed roast chicken. So delicious and easy! Meanwhile grate the parmesan and set to one side. Add the butter to a heavy based skillet and let it melt over a low heat. Once the butter has melted grate in about 3/4 of the black truffle. Stir well and then remove from the heat. Reserve 1/2 cup of the pasta cooking water and then drain the pasta. Stir the pasta into the butter, along with 1/4 cup of the reserved water. Stir gently over a low heat until everything is combined. Add more water if it starts to feel sticky. Add the parmesan and serve immediately with fresh parsley garnish and more black truffle. 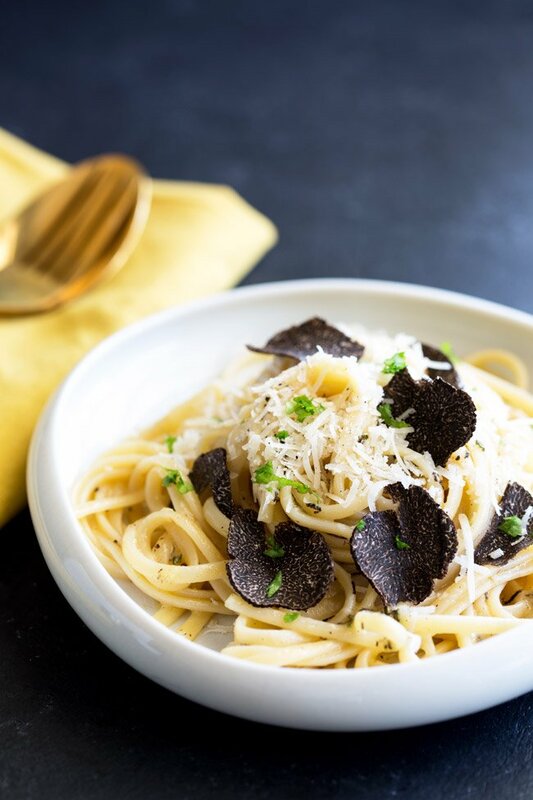 If you love food why not subscribe to my newsletter, I will drop you an email every now and then, just to say hi and send you a couple of recipes I think you might love, like this 5 Ingredient Black Truffle Pasta. 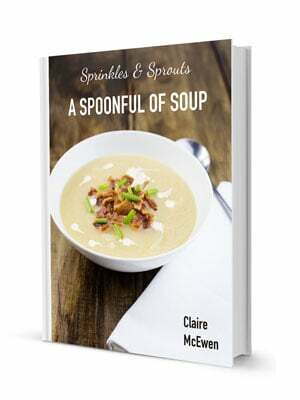 Claire, it’s really awesome! This will quickly become a favorite in our house! Thank you for posting this amazing recipe! My family and I enjoyed every bit of it. Definitely one I will continue to use. Love black truffles so much. The flavor is just so earthy and delicious. This is such a great recipe with the butter and parm cheese – my kind of comfort food. Thank you Danielle 😀 It is such a treat to get to use them for dinner.